Given the little smack of winter we’ve had in the Washington, D.C., area the past two days I thought that a guest post from upstate New York would be a perfect match. 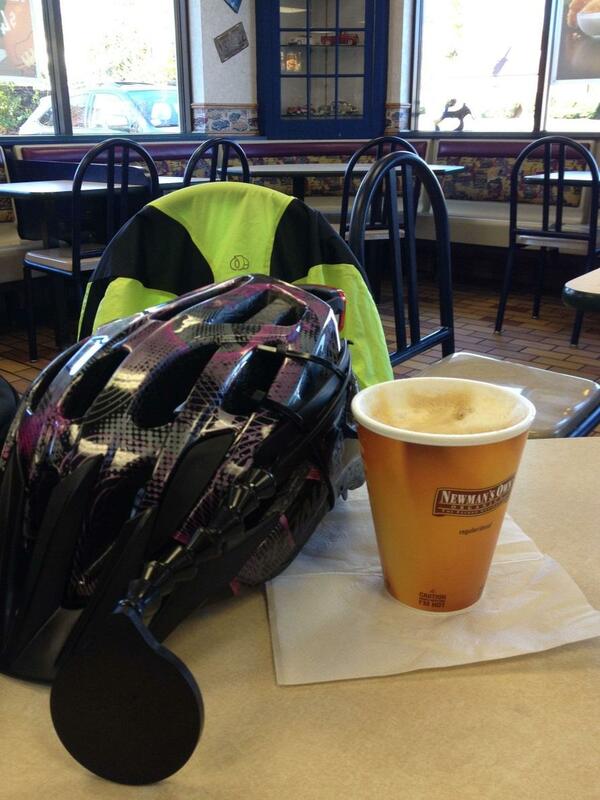 Linda, who resides in Albany, participated in the Errandonnee earlier this year and also completed the Coffeeneuring Challenge for the first time. While the majority of Linda’s rides occurred around Albany, her coffeeneuring also includes a visit to Massachusetts and the town where she first learned to ride a bike. The Ride: I hopped on my bike after a 2-hour drive home from Vermont. I had hoped to ride across dirt roads for a cup of coffee in Benson, Vermont, but a few miles into that ride, I remembered that all of the farms I had to ride past would have free-roaming dogs. I chickened out and turned back. 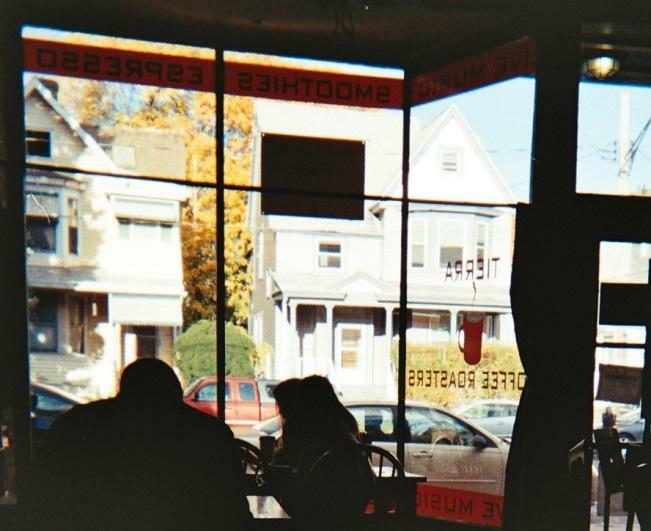 The Tierra Coffee Roasters on Delaware Avenue in Albany is just around the corner from my house. 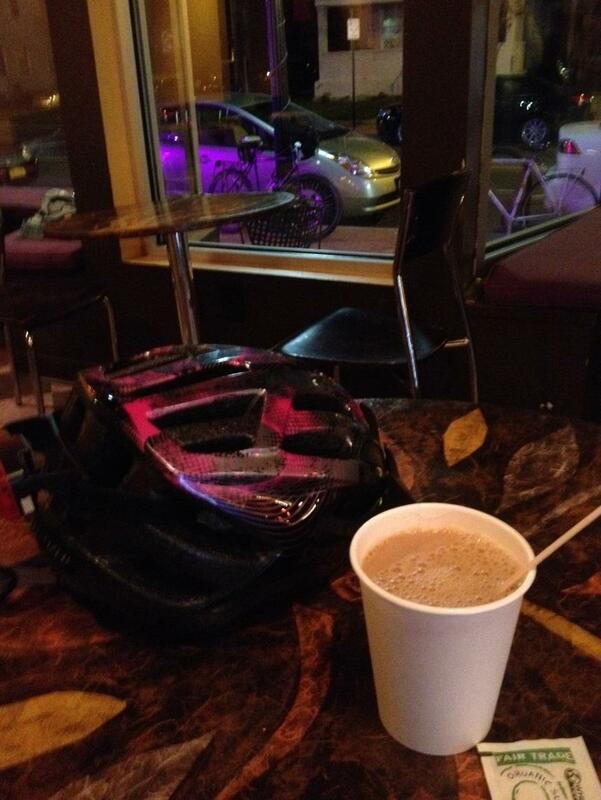 I extended the ride by a couple of miles to be sure it would qualify as a coffeeneuring run. It was nice to stretch my legs after the long drive. The Ride: Norfolk is the little town I grew up in back in the 60’s and 70’s. I got this Raleigh-made three-speed almost new when I was ~12 years old. We rode like the wind together for some years. My father installed a speedometer/odometer for me. Back then, speed was my priority, and if I remember correctly, I could get up to 30 mph going down the long hill near my house. A few years ago, when I retrieved the Fleetwing from my parents’ basement, I was surprised to see that I had put over 1000 miles on the bicycle during those few years. This may not sound like an impressive distance to a serious cyclist, but I accomplished this without ever leaving the town of Norfolk! 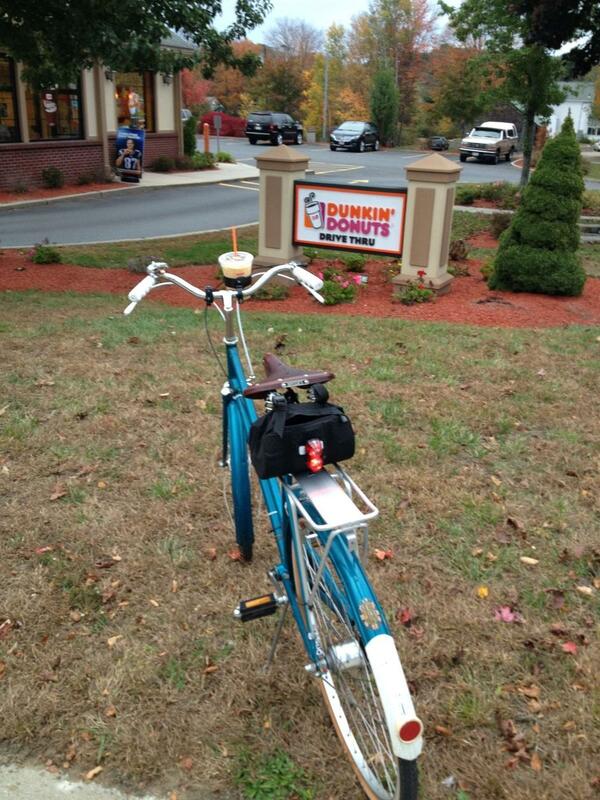 Coffeeneuring Ride/Cup 3 was my first ride to the center of town on this old bicycle in close to 40 years. The Surly Disc Trucker parked outside of McDonalds in Millis, MA– drop bars are visible at the bottom of the window on the right. The Ride: Rolling hills, windy road. I didn’t encounter any disrespectful drivers. I’ll bring my bike(s) here again when I come to visit. The Surly Disc Trucker parked outside of The Daily Grind. The House Blend is saving the table. The Ride: This was my first chilly ride of Autumn 2013 and the dropping temperatures and blustery wind brought back fond memories of the Winter Errandonnee earlier this year. The Schwalbe Big Bens are a new addition to my Surly that I am enjoying very much for city riding. Early 90’s Trek 850 Mountain Track/Commuter parked just to the right of the Honest Weight sign. 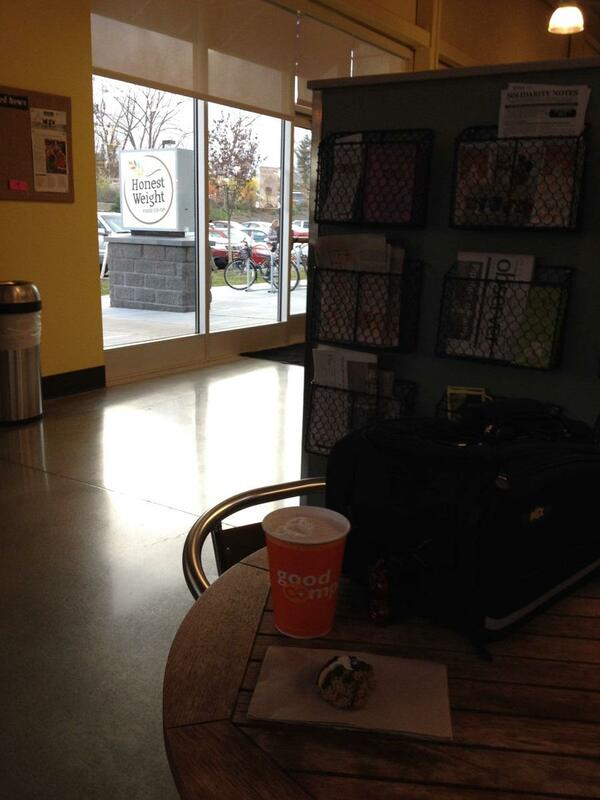 Pumpkin Spice Latte, trunk bag and treat in foreground. The Ride: My destination was the spiffy new facility and location of the Honest Weight Food Co-op; I pedaled here by bicycle many times this past summer. Riding across the city of Albany is moderately challenging, mostly because we are still working on getting motorists and cyclists to play well together. 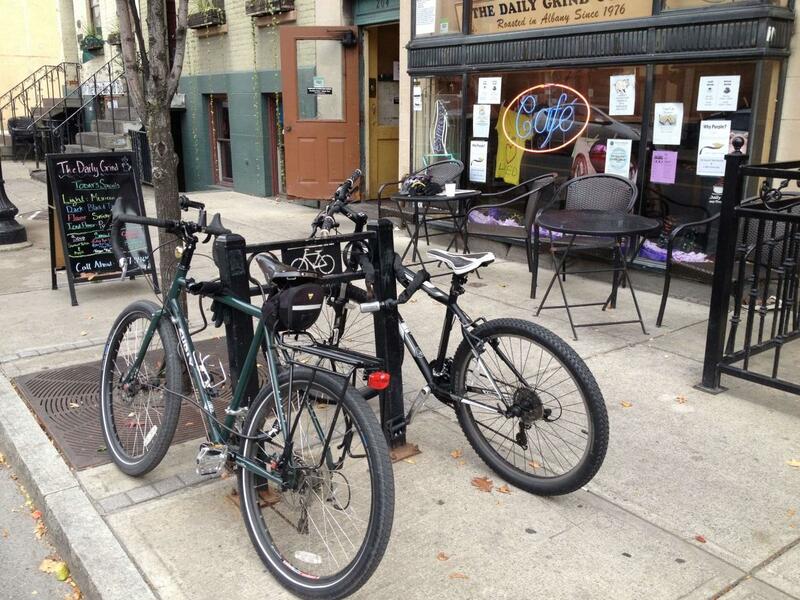 The city has been working hard with local cycling groups to make the city streets bicycle friendly. I chose to ride my early 90’s Trek 850 Mountain Track bicycle that had just been returned to me by the 13-year old who borrowed it for the summer. I’ve been spoiled by the Surly. At the Madison Ave Tierra Coffee Roasters. Bike helmet and gloves are in the missing (and woefully underexposed) foreground; this part of the photo is available on request. The Ride: This was another cross-city ride, this time to the sister store of the Tierra Coffee Roasters on Delaware Ave that I visited for Ride/Cup 1. When I arrived, I discovered I had left my iPhone at home. I ducked into the CVS on the same block and bought an old-fashioned disposable film-based camera so I could snap a few official photographs. Note to self: Next time, ride home and get the iPhone! 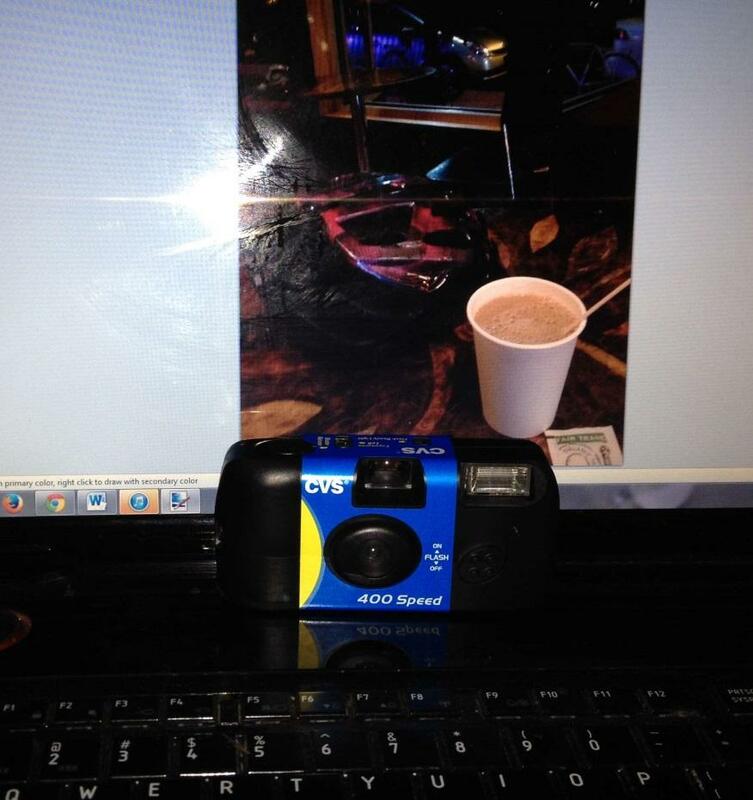 A photo of the disposable camera that contains the photo associated with this ride! 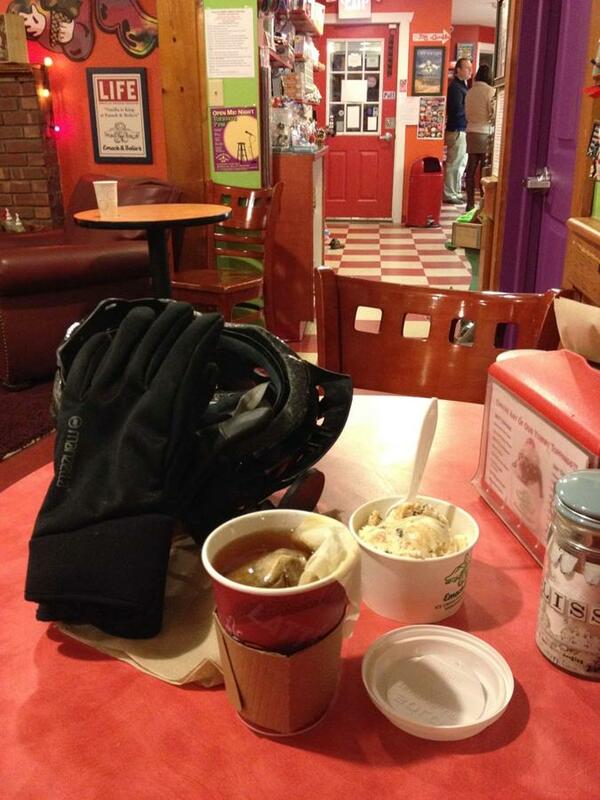 Freshly steeped Chai tea, ice cream and bicycle gear at Emack and Bolio’s – Delaware Ave. Albany. The Ride: Emack & Bolio’s is within easy walking distance of my house, so I took the long way around several neighborhoods to pull off a qualifying ride. It was chilly enough to don gloves and headband, but not too chilly to forego ice cream! Thank you, Linda, and congratulations on going two for two with Chasing Mailboxes challenges this year! And P.S., my Surly has spoiled me, too! Bravo from a native Albanian. Extra bonus: I learned that Albany has an Emack and Bolio’s, my favorite Boston ice cream parlor from my college days at BU.